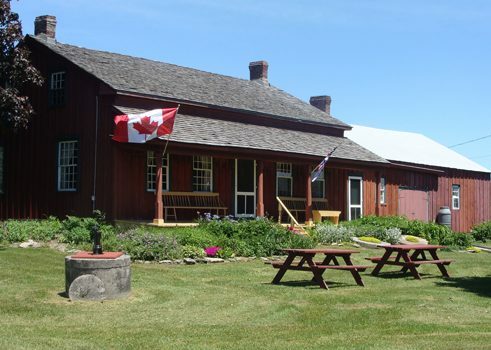 Waupoos is located on the eastern end of the picturesque Prince Edward County peninsula in Lake Ontario. Ed Neuser, a machinist of German origin who came to Canada in 1957, planted the first grape vines here in 1993, paving the way for a flourishing wine industry. Today, the delicious wines from Prince Edward County are an insider tip amongst wine lovers. Ed Neuser was not the first German to settle in Prince Edward County. There are also families of German ancestry who have been established here for a long time, such as the Minakers (from Meinecke/Moennecke), the Bonhards (from Bangert), or the Demhardts. More than 200 years ago, the then-undeveloped region around Waupoos was settled by pioneers of German descent, who cleared the woods under extremely hard conditions in order to make the area suitable for agriculture. 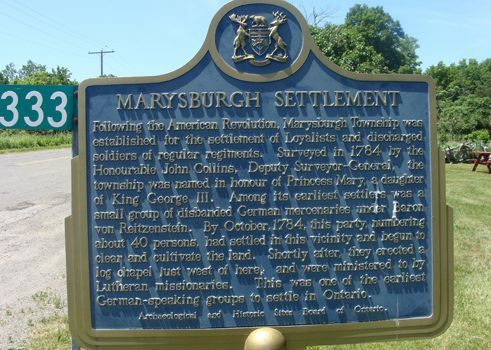 These pioneers were hired soldiers from the Prince Friedrich regiment who had fought on the side of the Loyalists in the American War of Independence, and the English crown granted them land in Marysburgh (Prince Edward County) in return. Under the leadership of their former superior officer, Baron Gottlieb Christian von Reitzenstein, they undertook the arduous trip along the Saint Lawrence River from Lachine to Cataraqui, today called Kingston. At the end of their journey, there wasn’t much left over from their once-richly decorated uniforms, and the morale of the ragtag troops sank to an all-time low when they had to endure several more months in Cataraqui because their land in Marysburgh was not yet surveyed. Once the 29 men, seven women, and eight children finally reached the area allocated to them on October 4th, 1784, there was just enough time to erect some makeshift cabins to shield them from the winter, which arrived shortly thereafter. Marysburgh was at the end of the British chain of supply. The settlers were fighting to survive in miserable conditions, and food was often scarce. Therefore, Baron von Reitzenstein incessantly advocated the cause of the settlers to the representatives of the English Crown, getting as far as the governor. However, his requests were not answered, and his stake of almost 1500 acres was seized when he went into debt to help the other settlers. He subsequently left Marysburgh and headed to Quebec, where he died in 1794. Shortly after their arrival in Prince Edward County, the settlers built a small church. The wood for the construction was floated over to them from the sawmill in Cataraqui. Unfortunately, the community was too small to maintain its own pastor, so the Lutheran church was demolished in 1800. The plot of land next to the church was bought by the British loyalist Peter Rose from a mercenary of German origin who wasn’t made for the hard life in Marysburgh. Upon their marriage, Peter Rose’s wife Christina Bongard received 60 acres of land adjacent to this property as her dowry. Here, Peter and Christina used the pinewood from the wreckage of the Lutheran church to build their farm, which still exists today. The Rose Cemetery located behind Rose’s house was originally a German cemetery, as its old name (“The Old Dutch Burying Ground”) implies. The Rose House itself has been a museum since 1964. With its long veranda out front, the house has remained in its original condition with the exception of a couple of minor changes. The German welcome message painted on the wood at the entrance was added later and doesn’t belong to the original features. There is also a plaque on the street in front of the museum that reminds visitors of the brave German-speaking mercenaries from the Prince Friedrich regiment who founded the community of Marysburgh under the leadership of Baron von Reitzenstein.